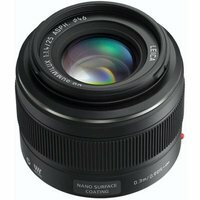 The Panasonic 25mm f1.4 Leica DG Summilux Micro Four Thirds lens is a light, high performance Leica DG lens that delivers superb optical performance for use everywhere you go. Based on the Micro Four Thirds Standard and meeting Leica's strict standards ensuring high optical quality, the Panasonic 25mm f1.4 lens will allow you to take stunning photos and videos wherever you are, even when shooting in low-light conditions. An Ultra High Refractive (UHR) index lens makes it thin and light without compromising image quality, while a nano surface lens coating means ghosting and flare will be dramatically reduced in your photos, further emphasising the high image quality. From daily snapshots while out and about; to indoor portraits without flash in low light levels; to creative images which take advantage of its beautiful peripheral defocus effect, the Panasonic 25mm f1.4 Leica DG Micro Four Thirds lens turns everyday moments into works of art.